But have you checked out the second tier of Rudolph specials? 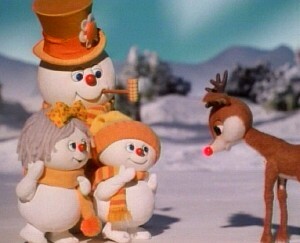 Last weekend I caught a bit of two that I hadn't seen in years: "Rudolph's Shiny New Year" and "Rudolph and Frosty's Christmas in July." Together, these two contain some phenomenal nuggets of nostalgia, including appearances by Red Buttons, Ethel Merman, Shelley Winters, Morey Amsterdam and Frank "The Riddler" Gorshin. They're worth it for the voice talent alone. But then you add the odd plots -- Rudolph teams with a caveman, a knight and Ben Franklin to go find Baby New Year, for instance -- and you've got yourself some must-see holiday TV right there. When I was a kid, I found Eon to be both terrifying and tragic. He was a scary monster, but it wasn't his fault that he was going to die!